The ancestry of the motor car goes back to 1769 and one Nicholas Joseph Cugnot. 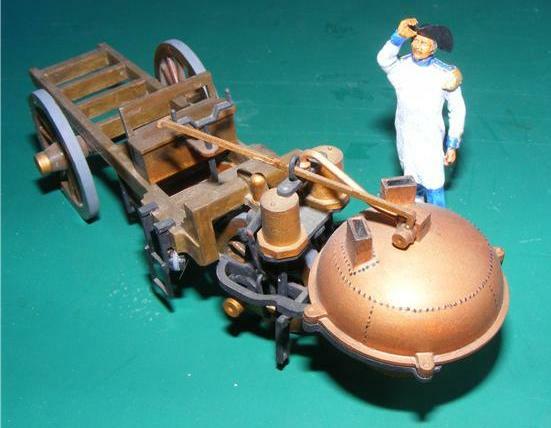 The French Government was desperate for an artillery tractor, something to pull these heavy items…. Cugnot answer was a fardier à vapeur or steam dray. Cugnot presented his Government with a 3-Wheel vehicle weighing almost 5 tons. 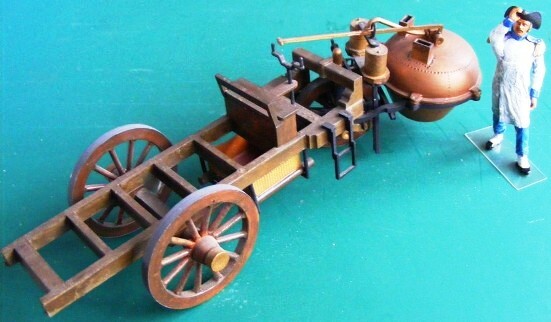 The machine consisted of 2 parallel vertical bronze cylinders (with a displacement of 62 litres), in which the steam was utilised, a furnace, a boiler, and a piston engine all mounted on 3-wooden wheels with iron tyres. The Boiler and furnace were mounted in front of and over the front wheel severely limiting vision as well as the steering. Could carry 4 tons at 2 ¼ mph. A prerequisite of a steam engine is water, but this vehicle had no water tank, and hence the machines duration was only 15 minutes. 15 minutes at 2 ¼ mph isn't very far, but all the same the idea showed possibilities. The vehicle was demonstrated to high-ranking officers and officials - and promptly crashed. Poor Cugnot therefore has the unenviable distinction of being involved in the first road vehicle accident and of being the first driver taken to Court and fined for careless driving! But Cugnot had the last laugh - The replica built from original drawings for the Paris Museum does not, or will not, work. 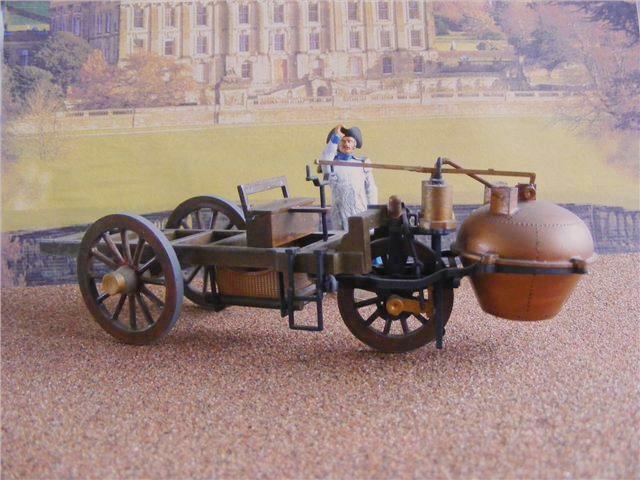 From 1786-1840 more than 40 steam vehicles built in UK, including those by the great Richard Trevithick. But this age of experimentation on the roads was not to last. The country gentlemen who at first opposed the intrusion of noisy, smelly steam locomotives in any form, soon saw the advantages of the railway. They sold their land to the railway companies and invested in their booming shares. The roads reverted to the horse but the stagecoach succumbed to the railway and the carriageways, potholed and rutted, just crumbled away. All was not lost though and by the mid 1800s the large steam powered agricultural engines were starting to take to the roads. In 1865 Locomotives on Highways Act stated that any Locomotive road engine must have 3 attendants, one whom must be walking 60 yards ahead of ther engine carrying a red flag to warn other road users. Just in case the point was missed speed limits were imposed. A maximum speed of 4 mph in the country and just 2 mph in town. This act was folllowed by the 1878 Highways and locomotives amendment Act. Local Authorities were given discretion about the flag and the red lantern, and the distance reduced to 20 yards. 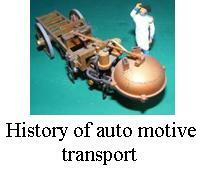 The result of all this legislation in Britain was to suppress experiments in powered road transport. In 1901 Thomas Edison wrote: "motorcar ought to have been British. You first invented it in the 1830’s. You have roads only second to France. You have thousands of skilled mechanics, but you have lost your trade by the same stupid legislation and prejudice that has also put you back in some departments of the electrical field". Hard to argue against! This model was built around 45 years ago, C.1963 from this. Precisia is now a very obscure, French manufacturer who's les Teuf Teuf series kits were very popular. Built straight from the box it is not only an historically important vehicle but stands as a model of historical interest due to the example of early 1960’s modelling techniques and products. It is brush painted with Humbrol enamels having been constructed using tube glues.